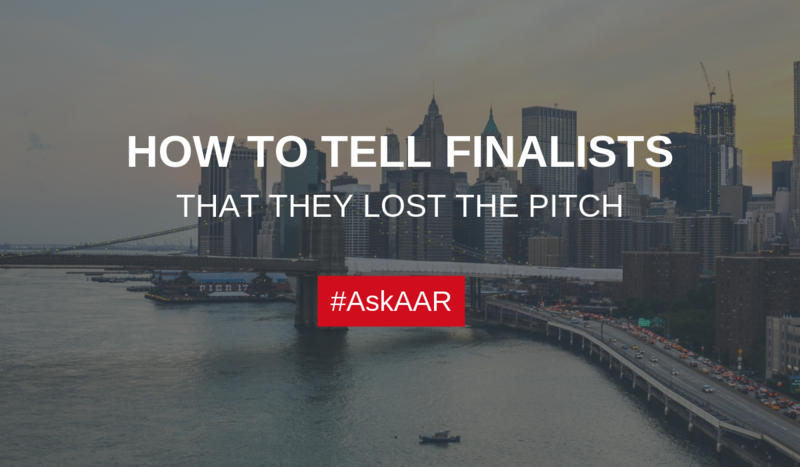 How To Tell Finalists That They Lost The Pitch from AAR Partners on Vimeo. This is one heck of an important question. First of all, agencies have typically spent months of working on your pitch process. They sacrificed nights, weekends, family time, and spent multiples of thousands on hard and soft costs in an effort to walk away with the prize. With that said, they’ve earned the right to know exactly why they lost the pitch. Client’s often feel uncomfortable with this conversation and comment that they would rather not debate over their decision. In almost two decades of managing agency reviews, there’s never been a debate over a client’s final decision with the losing agencies. Disappointment? Yes. Momentary deflated morale? Sure. An uncomfortable moment of silence? Certainly. But all reactions that are to be expected. So how do you deliver the news? Although the losing agencies will be disappointed, they greatly appreciate the courtesy, honesty and feedback in order to help them know where they fell short for learnings that can be applied for future pitches.